I thought I’d do something different (for my blog) today and post a few older photos of ways I’ve styled the same skirt. If people like it, I’m thinking I might make it an ongoing type of post. I’ve always enjoyed other bloggers’ “remix” posts, even if it is an excuse to reuse old photos. 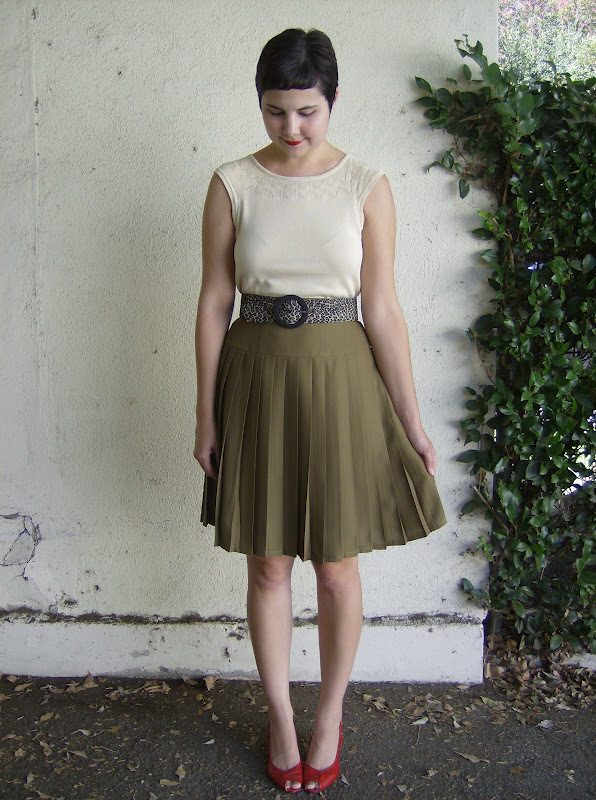 Anyway, dug up from the past, here are four of my favorite ways I’ve worn my moss green pleated skirt. This is one of my few outfits that ever made it into the Chictopia style gallery. I liked it a lot personally, and I got a compliment from an elderly woman at Target the day I wore it. I think this skirt goes well with a wide belt because the waistband is so tall. Also, I miss that purse! I found it at Quality Thrift and the oxblood color was perfect, but it was pretty cheap and fell apart from being used a lot. I hardly ever wear a belt over a cardigan, but I really loved this outfit because I think the blues and green are great together. This outfit was not popular on Chictopia. It made me feel good, though. I remember wearing it to run some errands in Old Town Pasadena. I liked how the neutrals worked here with the red lips, leopard belt, red shoes combo. This outfit is all thrifted and reminds me that I need to break out that belt more often. In fact, hmmm, all my favorite outfits with this skirt so far have involved belts. Time to stop being lazy and work them into more outfits. This felt like a good fall outfit for Southern California...appropriate for hot weather but with turning leaf colors. Unfortunately, I think I may have sold that top at Crossroads. I need to go look in the last bag I took there and see if it’s gone because now I kind of regret taking it in. I never wore it much because it had a stiff zipper up the side that made it impossible to tuck in. It worked untucked with this skirt, though, for a drop-waist effect. I always like these kinds of posts - and I liked the belted cardigan one best. I really like remix posts, your skirt looks great in all the different outfits! It is abrilliant idea the remix post. I love the skirt in every shot, well I love SKIRTS, lol. is it actually possible to give a damn one way or another? worry about something that matters. meaningless trivia such as this are a symbol of the downfall of america, if not mankind. ??? Is this for real? I like the first and last looks best. I love the re-mix posts. You are very creative with your individual pieces. I'd like to bring more creativity into my outfits. awesome skirt and it's so versatile. the first and third one are my faves. I really love remix posts so I'm glad you've done one! That green skirt is a great staple piece. I wish I had more things in that color. I think it's so nice for fall. You look great in all the ways you wore it!